I've been hard at work on a new pattern - Kid Eating Monster Bacalava. 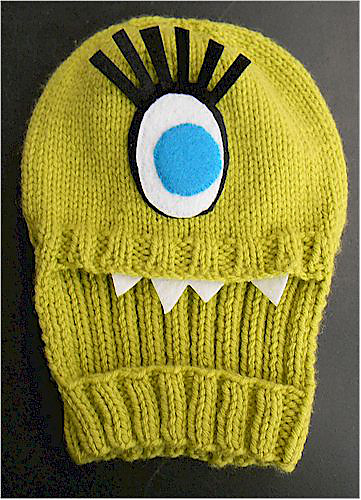 I'm working this pattern up with sizing from Newborn to Adult and it will have instructions for any number of creative embellishments to really make your monster one-of-a-kind. This pattern is currently in the test knitting stage of development. I hope to have it launched and available early September - just in time for Halloween knitting. It makes a wonderful instant costume. It will also make an excellent helmet liner for skiers, with an added surprise for the lodge later. And if you thought I'd be taking a break from knitting during the summer months... no way! Today I updated my KnitMeter with projects I'd completed this month, adding .67 miles of knitting and discovered I had surpassed last year's mileage of 3.16. I'm actually really excited about this - I'm on schedule to double last year's mileage. Now you KNOW I'm obsessed! Day 2 - Knit Research & Rescue - Success (mostly)! Today's class went well... mostly. Today I used a teaching technique where you demonstrate an extreme to set the basic concept up in the minds of the students as being both easy and attainable. Unfortunately, in doing so, I overwhelmed my students with an advanced correction technique - changing cable twists. This caused us to run a full hour over the scheduled class time, which I did ask their permission to do. When I teach this class again in the future, I'll skip this technique, and instead perhaps include it in a more advanced second level class. There are just so many other things I could include in this class, and I want to give students as many options as possible. We did however successfully cover all scheduled topics, and used some of the overage to cover incomplete stitches as well. Next Friday will be a much lighter class. We will cover all aspects of lifelines (insertion, dropping down to and picking up from and drilled lifelines) as well as weaving in ends, general course review, Q&A and troubled project review. I can't express enough how much I've enjoyed teaching this class and getting to know these talented ladies! 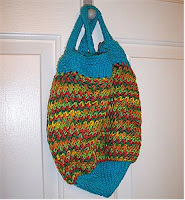 Ravelry user jolbrooks recently completed my Cotton Carry-All pattern and posted her results along with some comments. "This was a free pattern available here on Ravelry. I made this smaller because I only had 1 skein of the ombre in my stash and didn’t want to do a color change while knitting the mesh pattern. It was a fun and easy project and I found the directions very easy to follow. Another plus was that the bag was knitted top down so I think that it could be easily size adjustable. Finally the handles are sturdy and stable." "I am teaching some new knitters and they have enjoyed watching me knit this one and how easy it is to work up in spite how complicated it looks. Over my 60+ years of knitting I have never found a pattern or even a kit that I really liked the outcome. Yours - is awesome!!! I really like the sturdy feel of the handles and the whole look of the bag. Believe me - everyone on my Christmas list is getting one this year even the guys. Just knitting up in neutral colors or using brown tones. Since mine turned out smaller than I would use at my local farmers market I am using it for a knitting project bag and getting tons of “oh mys”. Directing everyone to your pattern. Thank you so much for the pattern. You are amazing." jolbrooks you rocked my world today. Thank you so much for this feedback and for letting me brag on my blog. You are the reason I design! jolbrooks also had some great suggestions! "I think this is a “must do” for new knitters. It will build confidence and if they use a cotton cone they won’t have to fuss about anything coming apart. I took extra duplicate stitches in fastening my handles so there wouldn’t be any strain on the top part of the bag. Was thinking I might use clever button as just a deco or even use another color and make a design in the tabs of the handles." Cotton Carry-All is still available for free download on Ravelry. 664 Downloads to Date - woo hoo! I'm very proud to report that Day 1 of my class was a success. I really enjoyed teaching this class - mostly because of my students. They each had their own reasons to be there, and were eager to learn. We laughed and acknowledged our successes throughout the exercises. There were five students of varying skill sets, and each one of them successfully completed the exercises of the day. I believe everyone learned and had fun doing so. I'm so proud of their accomplishments. I'm excited for next week! Day 2 of this class covers the correction of Misaligned Rib Stitches, Misplaced YOs, Split Yarn Stitched, K1TBL/Twisted Stitches and Cable Stitches. I've also been asked to demonstrate proper weaving in as well as correcting incomplete stitches. These items may have to wait for Day 3, when time better allows, but most definitely will be covered! Check out this website - I thought it was a really clever way to pack a picnic. Yes, you could do the same thing in plastic containers, but it was a attractive, clever use for all those mason jars I have hanging around from the canned goods we ate over the winter. 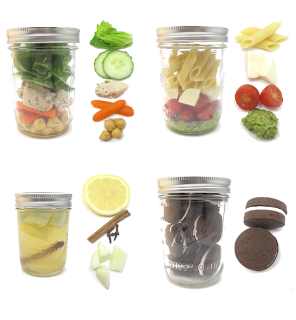 A quart sized jar would easily accommodate a fresh shake & eat pasta salad for 2-4 people. I liked the recipe for White Sangria as well - a fun twist on a festive classic. I would completely skip the dessert they suggested and put make a fruit salad instead. Ok, maybe with chocolate chips in it! The Wallow Fire in Arizona is still plaguing us. We first started to see smoke about 7pm Thursday, June 2nd. Since then, the smoke is a daily occurrence, sometimes reducing visibility to under 1/2 mile. You can readily see ash floating in the air. John and I avoid being outside during the worst of it as much as possible. Evenings are the worst. It has been hot and unfortunately, using the evaporative coolers is not an option as it only brings more smoke into the house. The dogs are becoming accustomed to nightly wet towel baths, just to get the dust and ash off their faces and bodies as much as possible to reduce them ingesting it. Rain would have an impact and would certainly help to improve our air quality, but alas, the drought continues. Our garden continues to thrive. Peas have lovely blossoms on them; we are beginning to think they like the smoke. The broccoli seems to have survived the transplant, but as to whether it will produce is still yet to be seen. Onions and carrots continue to appear. John has been busy working to replace worn parts on our irrigation system so that we can automate the process for the summer with timers. Until then, we are out watering as late each afternoon as we can before the smoke mass begins to smother. In other news, my dual-sport is suffering an electrical problem. We've already gotten one part in and replaced it only to find the problem is apparently bigger than that part alone. I don't have a big issue with not having access to the bike right now - there is another bike I can ride and I really don't want to be riding in the smoke anyway - but John HATES electrical issues in motorcycles and is quickly becoming frustrated with the situation. He spent a lot of time in the garage last night pulling it apart and testing various electrical connections. I bought pizza last night to thank him for his efforts. He is, afterall, my favorite mechanic. I'm very excited (and nervous) - tomorrow is Day 1 of my Knit Research & Rescue class. I've got my materials ready and tonight I'll be creating my sample swatches on giant needles for improved visibility during referencing in class. This class is all about being able to recognize mistakes and fix them on the fly without having to rip back miles of work. Day 1 I'll be covering how to correct accidental YOs, KF&B/Bar Increases, K2TOG, and Dropped Stitches. The class format is unique because I have students intentionally create the errors in a swatch, and then we look at the anatomy of the stitches and errors and use a drop-down method of correction. This class was born from my very "Type A" perfectionist need to have absolutely perfectly knit projects and my frustration with frogging out row after row of perfect knitting to get to some minor flaw that drove me insane. I don't expect my class participants to be quite as extreme about it as I am, only to be interested in making corrections in their work that disturb the appearance of the finished object or cause them issues when following patterns. I expect I will learn as much as the students, if not more.